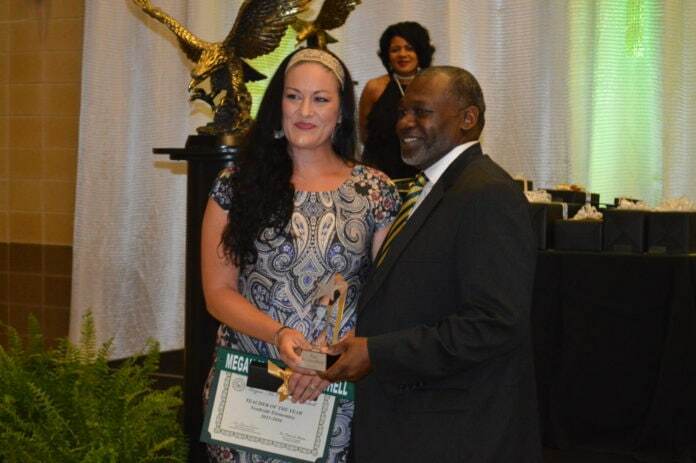 DeSoto ISD Elementary Teacher of the Year Megan McCutchen-Mitchell with Superintendent David Harris at the 2016 Employee Appreciation Banquet. DESOTO—Recently, Northside Second Grade Teacher Megan McCutchen-Mitchell was nominated for the LifeChanger of the Year award. Sponsored by the National Life Group LifeChanger of the Year recognizes and rewards K-12 education professionals. LifeChangers must be K-12 educators, teachers, administrators or any member of a school’s staff who makes a positive difference in the lives of students. If selected, she could win up to $10,000 and additional funds for her school. Mitchell, who was the 2016 DeSoto ISD Elementary Teacher of the Year, launched several community enrichment programs at her classroom to increase student’s experiences and expand their exposure to real world settings. The selection committee will select 15 national winners and a Spirit Award winner. The national winners are based on the individual’s nomination and includes their ability the make a beneficial difference in the lives of students, high moral and ethical standards, and leadership. The LifeChanger Spirit Award recognizes the community that shows the most spirit for their nominee. Residents can show their support through comments, shares on social media and recognizing the nominee at the campus. According to Mitchell’s nomination she relentlessly finds ways to give students exposure to all the learning opportunities her community offers. Her efforts began roughly six years ago, when the decision was made to minimize field trips for students. This was detrimental to students’ development. Most of the time field trips were the only exposure students would have to apply concepts or see concepts being applied in real world settings. Rather than being discouraged, Mitchell looked at this as an opportunity to change who she was as a teacher. She sought an outside the box solution to provide her students with these experiences. Mitchell researched release waivers, looked for free activities going on in the community and purchased family passes to local museums. With the support of her principal and family, she then began weekend field trips with small groups of students. The benefits to Mitchell’s students have been numerous. From the learning, to the relationships built with students and to her development as an educator.